In 1920, with the population of the Winnipeg’s North End growing rapidly, the Winnipeg School Board purchased a block of land on Arlington Street, between Alfred and Aberdeen avenues. 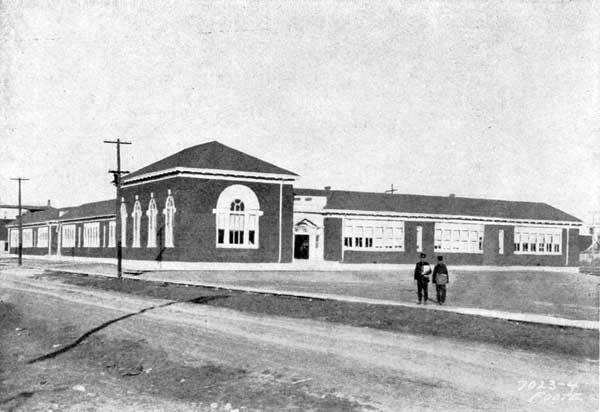 Later that year, day labourers under the supervision of the Sutherland Construction Company erected a one-storey school designed by local architect J. N. Semmens, comprising 15 classrooms and an assembly hall, at a cost of $127,000. When the school opened in September 1920, it was named for nurse Margaret Scott. A portrait unveiling ceremony was held on 25 February 1921, wherein Mrs. R. T. Riley, President of the Margaret Scott Nursing Mission, unveiled a brass-framed and life-sized crayon portrait of Scott and presented it to School Board Chairman William John Bulman. Mrs. Scott, also in attendance, was presented with a bouquet of roses. Amongst the crowd of prominent citizens in attendance were senior district trustee Richard R. Knox and Mayor Edward Parnell. On 18 June 1957, the School Board announced that henceforth the school would operate as a part of the nearby Isaac Newton High School, which was converted into a Junior High School and called Isaac Newton School No. 1. Margaret Scott School took the name Isaac Newton School No. 2, with administration by the Vice-Principal of Isaac Newton School. The school also hosted staggered classes for students from Sisler High School prior to that school’s completion in the fall of 1957. Plans as of June 1961 called for Isaac Newton School No. 2 to be replaced in 1962 but these designs failed to materialize. The school stood empty and was informally decommissioned following recommendations to the board that it was “structurally unsound.” Administrators authorized its demolition without consultation with the Board. Early stages of demolition took place in 1963. Doors, some classroom fixtures, and washroom elements were removed for use in other facilities and a large hole was cut by contractors in the ceiling and walls to facilitate access. Meanwhile, a petition of 500 local residents was collected and presented to the Board. Demolition was halted and the building was ordered repaired and returned to operational status. The school was given back its original name and it reopened to students in the fall of 1963. In January 1990, the school was badly in need of renovation but the School Board would not commit the necessary resources. Instead, the school was closed and its remaining students were transferred to nearby Isaac Newton School. The building was demolished in June 1990 and its fomer site is now a public playground. Among the other teachers of Margaret Scott School was Eleanor A. Weselake Olynyk (French, Guidance, and Music, ?-1974). Source: Winnipeg School Board, Annual Report 1920, Legislative Library of Manitoba. “Portrait unveiled,” Manitoba Free Press, 26 February 1921, page 9. “Winnipeg schools, No. 41—Margaret Scott,” Manitoba Free Press, 2 December 1922, page 18. “Two schools - one name,” Winnipeg Free Press, 19 June 1957, page 3. “To convert Newton into Junior High,” Winnipeg Free Press, 28 August 1957, page 3. “You’ll have your school, parents told,” Winnipeg Free Press, 7 June 1961, page 3. “Isaac Newton High prepares for its 40th anniversary,” Winnipeg Free Press, February 1962, page 70. “‘Unsound’ school bldg. to be used,” Winnipeg Free Press, 5 June 1963, page 1. “School,” Winnipeg Free Press, 5 June 1963, page 10. Obituary [Eleanor A. Weselake Olynyk (1909-1981)], Winnipeg Free Press, 13 November 1981, page 29. Obituary [Eva Mae Harvey “Eve” Muldrew (c1923-1984)], Winnipeg Free Press, 5 July 1984, page 40. “School succumbs to wrecker’s ball,” Winnipeg Free Press, 3 June 1990, page 38.